Coach's Corner - Magic, Jabbar & Worthy hand signed Lakers jersey. 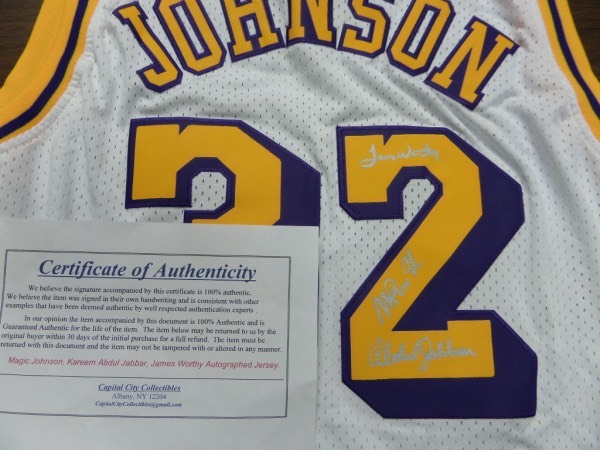 Go Back to Lot List Magic, Jabbar & Worthy hand signed Lakers jersey. This mint LA home white is trimmed in gold and purple team colors, and has "Johnson #32" sewn on back. It is really well designed and made, tagged right by Adidas, and comes back number signed by Magic Johnson, James Worthy, and Kareem Abdul-Jabbar. All 3 HOF Greats hand signed in silver paint pen, they are all Lee approved, and value is upper hundreds on this Forum showpiece.